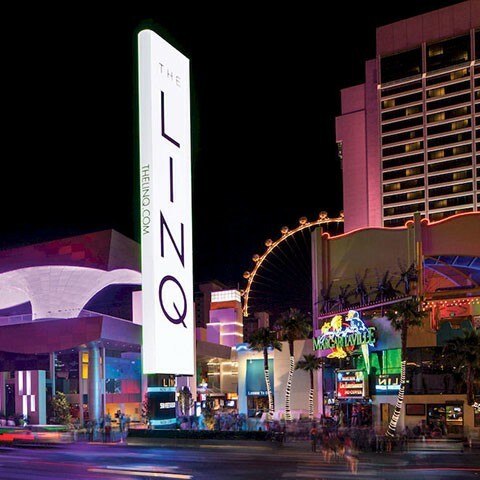 Located right in the center of the Las Vegas Strip, The LINQ Hotel & Casino is the social hub for trend-setters and partiers alike. Rooms include cutting-edge technology, modern furnishings and close access to the LINQ outdoor shopping district. The LINQ Hotel presents a collection of hip rooms and suites renovated with contemporary design touches and high-tech features, by a design team lead by Elkus Manfredi Architects.. One of the most central hotels on the Las Vegas Strip, LINQ Hotel options include stunning scenery in a High Roller view room or the poolside convenience of a Cabana Suite. The LINQ Hotel & Casino offers a unique Las Vegas casino experience. Let loose and play all of your favorite Vegas casino games, including poker, craps and video slots. Connect with Lady Luck on any of 830 hot Las Vegas slot machines that could hit a heart-pounding jackpot on any given spin! You’ll find all your favorites when you play slots at The Linq Hotel & Casino, including video poker, progressives – including statewide favorites Megabucks and Wheel of Fortune, video reels and many more. They offer Las Vegas gamblers games in denominations from 1¢ to $25.